Don't miss this rollicking fun presentation of a classic fairy tale where Goldilocks and Little Bear snoop through each other's houses. 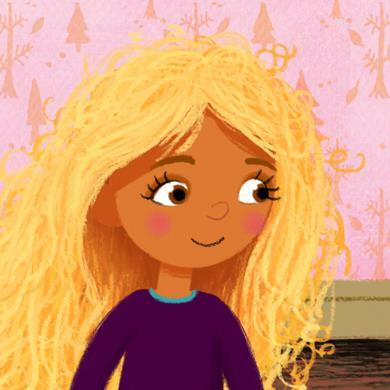 Goldilocks and Little Bear by Nosy Crow is simply brilliant! It presents the classic Goldilocks tale but adds a second story, told in parallel, about Little Bear, the youngest member of the bear family whose house Goldilocks is ransacking. As it turns out, Little Bear is doing the same thing to Goldilocks home. Goldilocks and Little Bear is one of the most innovative apps of the year! 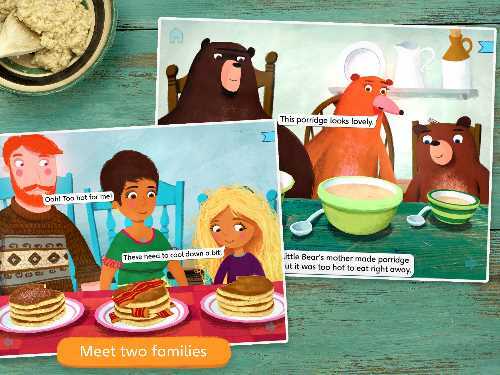 Kids start by reading the story about Goldilocks, listening to the narration as the words highlight and then tapping on the characters in the scene to hear more dialogue. 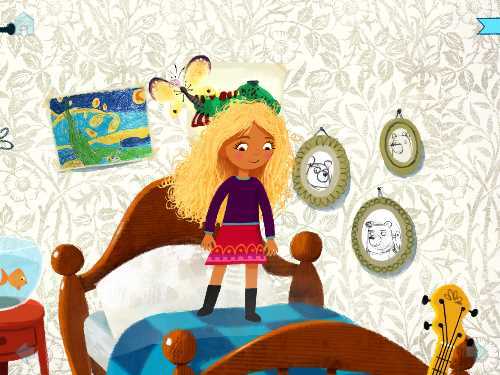 They can also tap on Goldilocks to make her move around and animate in the scene. At any time, if kids rotate their device 180 degrees to be upside down, the story about Little Bear will appear. It parallels the place in the story that you were just reading about Goldilocks. So if Goldilocks is in Little Bear's house sampling their porridges, then you will see Little Bear in Goldilocks's house sampling their breakfast of pancakes. Both of the parallel stories are charming. And it is so much fun to hear the same story told from two perspectives. The Goldilocks tale follows the norm with her sampling the Bear family's porridges and then deciding that baby bear's was "just right," so she eats it all up. True to the traditional tale, she tries the three chairs, and breaks Little Bear's rocker. But, when she checks out the three beds, she does so by jumping on them. This cute deviation creates a charming animation of seeing the the dust fly up from each bed. Little Bear's investigation of Goldilocks's home reveals three plates of pancakes, three closets, and three books to read. 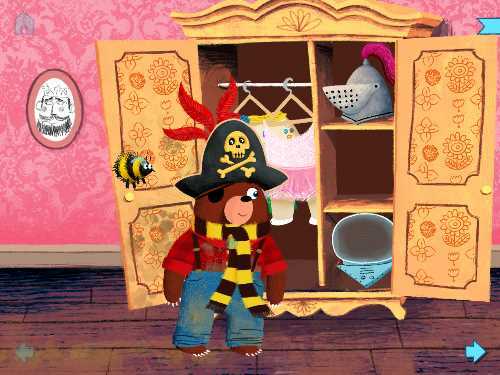 Little Bear eats Goldilocks's stack of flapjacks, tries on clothes from all three closets (the reader helps by dragging the outfits to the bear), and then samples the three books. Little Bear finds the Father's book about Woodcutting to be "too boring," Mama's book of ghost stories is "too scary," but Goldilocks's book of "The Three Little Pigs" (the Nosy Crow version!) was "just right." The scholarly little bear loses track of time as he becomes immersed in his reading. In these cleverly intertwined stories, Little Bear's parents scare Goldilocks awake, and Goldilocks's parents frighten Little Bear while he is reading. Both adolescents run out of the houses, only to crash into each other. The book ends with Goldilocks and Little Bear becoming friends and playing a game of hide-and-seek. Delivering two simultaneously-told stories in one app is an exciting concept, and this app delivers the switcheroo seamlessly. Each character's story is one that kids will want to read over and over again. And it's fascinating to flip the device and hear the same story told from a different perspective. Publisher Nosy Crow has made a name for itself in the fairytale apps market because they infuse humor and modern concepts into classic stories. This book app does the same. Little Bear's comments as he snoops in Goldilocks's house are hilarious. And when Goldilocks and Little Bear meet, their comments to each other will make the reader smile. I also enjoyed the little extra touches that Nosy Crow added, including seeing my face in the mirrors of the houses (the app uses the front-facing camera to project your image). The running away scenes in the end of both versions turn into a mini-game of tapping to make the lead character jump logs. And the animation and music in the scenes make the app come alive. Diversity representation in children's media is important, so that all children can identify with the characters. And most fairy tales fail miserably in this area by showing only white characters. 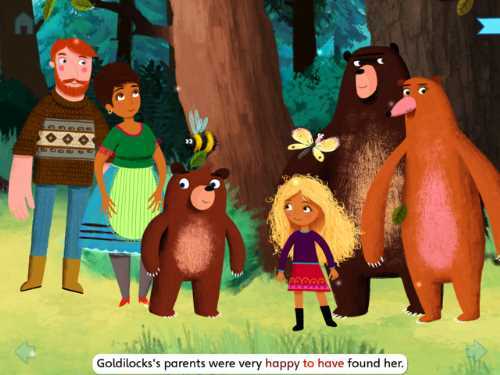 Goldilocks and Little Bear shows diversity in both sets of parents by having their skin/fur colors be different. This is a small change, but a powerful one. Kudos to Nosy Crow for thinking through this multiracial representation. All children will relish exploring Goldilocks and Little Bear. This app has great replayability by providing two parallel stories that kids can toggle between at will. Because of its interactive nature and humorous dialogue, it would also be a good app for librarians and teachers to show on a big screen during Story Time. If you would like to SEE what the inside of this app looks like, check out our video review here. 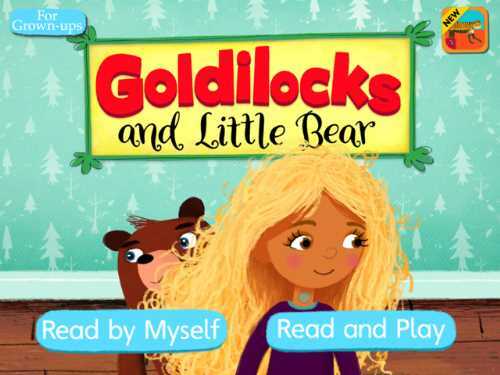 This Goldilocks and Little Bear by Nosy Crow app review was written by Jinny Gudmundsen.